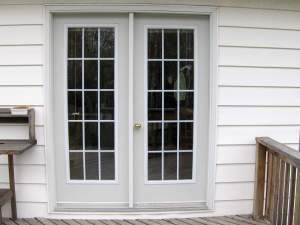 French Door Screens - Is your screen door missing ? Is your screen door missing ? French door screens must be on the endangered species list. Even in new home construction french doors get built in without any screening. The doors are built with the tracks ready for a screen but they are often not supplied with one. Who knows why the screens were not included, perhaps the builder just wanted to save a little extra money. In some cases, there is a separate company that installs the french door screens and somehow they never get put on, its surprising how often the sliders never get installed. Some french doors have no tracks at all. My tracks can be added to the top and bottom of the to allow installation of a slider. See how the lower screen track has been screwed to the sill in the picture below. Watch out when you are purchasing handles for your french doors so that they do not interfere with the closing of the slider. Some doorknobs stick out too far and will prevent the screen from closing properly. Also some frenchdoors may need to have the center section built out to allow the slider to seal properly. If you are putting in a new frenchdoor, bear the preceding things in mind and purchase one that comes with a slideralready installed. If you wish to have french door screens installed where both doors open, you may wish to have french door screens that cover the entire opening. Conventional patio sliders can be adapted to this style of by installing 2 parallel screen tracks on the top and bottom and having bug strips installed on the 2 sliders so they seal against each other when closed. A good glass shop should be able to sort this out without too much difficulty. A retractable screen is another possibility for this, although you may find it difficult to find one that will span a 60" to 72" wide frame. You may have to use two retractable doors which open from each side and meet in the middle. The pictures below shows the parts in one of my french door screen kits and the measurements you need to put it together. 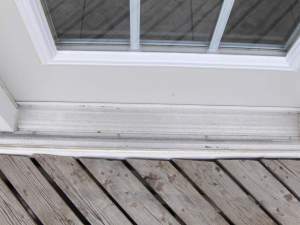 If your french door already has the top and bottom tracks, then getting a screen is simple. Just follow the measuring instructions in the picture and enter the dimensions in the quotation form at the bottom of this page. The section and top drawings show a single screen door for french doors where only one door is normally opened. If you want to have both doors operating, you need two screen doors to span the whole opening width with both french doors open. More on that further down the page. When the top and bottom tracks are missing, you will need to measure the width of your door so I can supply the tracks as well. Contact me and I will get the particulars of your door to supply a full french door screen kit with tracks. Installing the tracks is not difficult. They are simply held in place with wood screws going through the track and into the jamb. When installing a screen on a french door there are a few things you have to watch out for. First is the swing of the door. Does it swing out ? If thats the case you wont be able to put a sliding screen on the outside. A retractable screen on the inside might still work though. The next thing to consider is the outside door handle. When the screen door is closed will the door handle hit the new screen door frame ? You may have to choose a different lockset with a smaller handle or move the screen door track out far enough to clear the handle. If you have a french door where both the doors operate and you like to have them both open to enjoy the full width of the door you will need 2 screen doors overlapping each other to successfully keep the bugs out. This is a little more tricky to handle than a single screen installation. For one thing you need room at the top of the door to install two separate screen door tracks. That is not always possible with every door. You also need two tracks down below screwed into the threshold. On double french doors, the astragal in the center where the two doors meet is usually small so you dont often have to worry about it interfering with the operation of the screen doors. You still need to be check how far the lockset sticks out, some handles can stop the screen door from closing properly. Heres a guide to measuring for double screens in a dual operating french door. Measure the distance form the header to the threshold and subtract 1/2 inch to get the height of the screen door. You need 2 inches space at the top header for the new top tracks. The view above is looking down from above on the door and shows how the screen doors overlap. The amount of overlap is no more than 2 inches. To measure the width of the screen door in a dual french door system measure the opening width between the vertical jambs and divide that number by two. A pdf version is provided below if you need to print out this drawing. Most french doors have a vertical wooden strip could an astragal that goes between the two door sections, regardless of whether both door open or not. Will there be a space between the new screen door and the astragal ? Sometimes this gap can be several inches and it will prevent the screen door from being effective at stopping bugs. Do both of the doors on your french door open ? If you install a single screen door, it will prevent you from enjoying a clear view when both doors are wide open. A retractable screen is an effective alternative if your french door has some or all of the conditions listed above. Retractable screens are really the only option if you have both doors opening and want to maintain a completely unobstructed view. As well, the french door repair questions and answers page shows the experiences of others who have tackled this issue.